Biotinylated Human IL-15 R alpha, Fc Tag, Avi Tag (ILA-H82F4) is expressed from human 293 cells (HEK293). It contains AA Ile 31 - Thr 205 (Accession # Q13261-1). The protein has a calculated MW of 46.6 kDa. The protein migrates as 60-75 kDa under reducing (R) condition (SDS-PAGE) due to glycosylation. 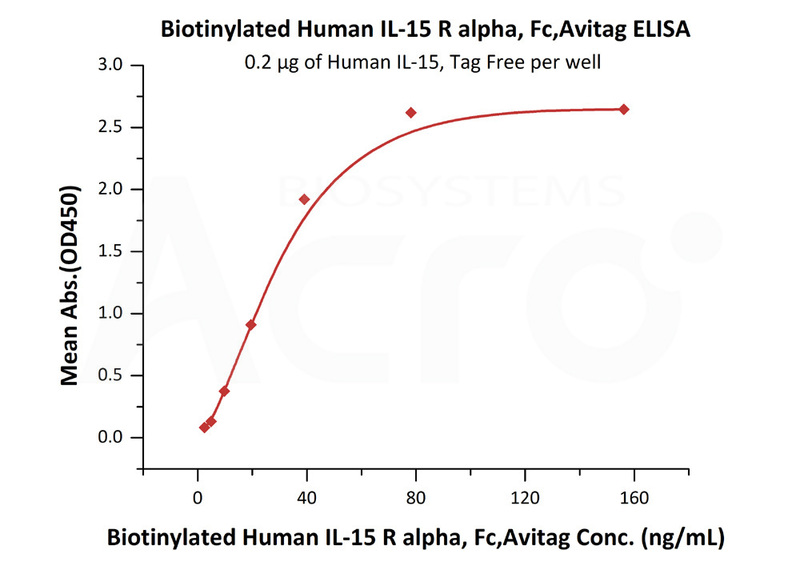 Biotinylated Human IL-15 R alpha, Fc Tag, Avi Tag on SDS-PAGE under reducing (R) condition. The gel was stained overnight with Coomassie Blue. The purity of the protein is greater than 95%. Immobilized Human IL-15, Tag Free (Cat. No. IL5-H4117) at 2 μg/mL (100 μL/well) can bind Biotinylated Human IL-15 R alpha, Fc Tag, Avi Tag (Cat. No. ILA-H82F4) with a linear range of 2-39 ng/mL (QC tested). IL15R is a heterotrimer of IL15RA, IL2RB and IL2RG. 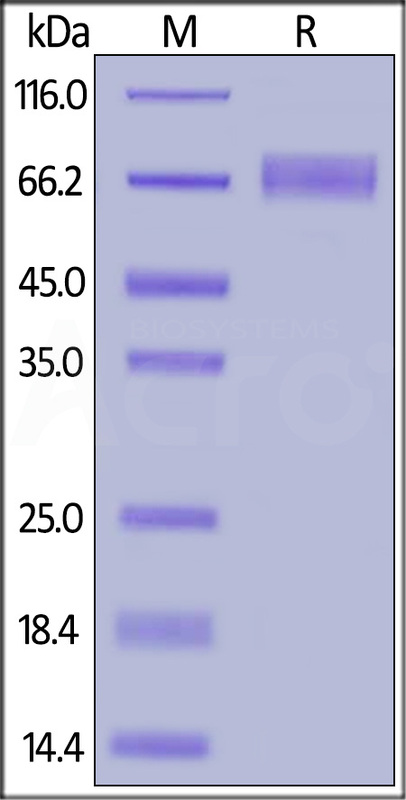 IL-15RA, also known as CD215, IL-15 R alpha, is a widely expressed 60 kDa transmembrane glycoprotein. High-affinity receptor for interleukin-15. Can signal both in cis and trans where IL15R from one subset of cells presents IL15 to neighboring IL2RG-expressing cells. Expression of different isoforms may alter or interfere with signal transduction. An interleukin (IL)-15 superagonist/IL-15 receptor α fusion complex (IL-15SA/IL-15RA; ALT-803) activates the IL-15 receptor on CD8 T cells and NK cells, and has shown significant anti-tumor. Signal transduction involves SYK. Higher levels of soluble sIL-15RA form in comparison with membrane-bound forms is present in all brain structures.